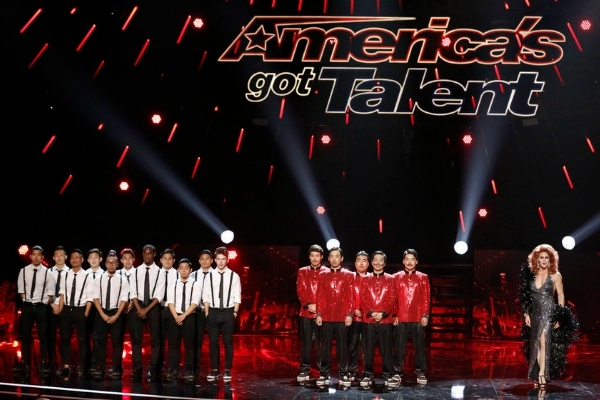 At the top of this week’s “America’s Got Talent (AGT): Judge Cuts” episode Howie Mandel pulled-up with his special celebrity guest Marlon Wayans who joined the judge’s panel this week to help them determine which seven out of this week’s twenty acts went through to the live shows. After AGT Host Nick Canon introduced the judges, Marlon joked that he’s glad to be in the same room as Nick Cannon because too many people get them confused and think that they’re each other. Howie then told Marlon about his Golden Buzzer opportunity where he can send an act directly to Radio City Music Hall with the hit of this button. Marlon then hit the button, but luckily, unlike last time when guest Neil Patrick Harris hit it, gold confetti did NOT fall to the stage. They’re a group of three young men who want to be the boy band of AGT even though they don’t possess the traditional good looks of a traditionally successful boy band. Judges’ Comments: Mel b. said they started out shaky, but once they hit the harmonies, they were great. Marlon thought it was awesome and they seemed that they were “seasoned”. Howard told them guys like them always finish last. He was referring to their plain looks. They are talented. But, with seven slots, it’s going to be difficult. They’re a group of five young men ages 18-19 who did a dance routine on skates. They were very impressive and memorable. Marlon gave them a standing ovation. Howard said he knows he’ll remember them that night during Judge Cuts deliberations. They are a group of young Asian Hip-Hop dancers ages 25-33 years old that gave an amazing performance to a broken Jackson 5 oldie but goody record “I’ll Be There” while moving to the jerkiness of the broken record. Is a hand-balancing act by 34-year-old Oleksiy Mogylnyy who’s a massage therapist who uses his wife’s dresses on the mannequin that is incorporated into his act. He’s a 26-year-old country singer with a Rock-a-billy look, tattoos and all. Johnny lost his son to cancer at age five and dedicated his first audition song to him. He tried to make the connection again. Judge’s Comments: Howard responded “you have that uncanny ability” to taking a song and make them feel something. Heidi said she was also touched by his song and that he has a beautiful voice. Marlon said the song made him think about his own childhood and thought it was great that he could make them feel that. Mel B. said this time there was a “massive disconnection” and he was a bit pitchy. Howie said he doesn’t hear his voice, pitchiness, nor guitar, but hears his soul. His a 54-year-old magician who’s act consisted of Howie initialing a twenty dollar bill, then Dana made it disappear and re-appear inside of an egg. Oh yeah, and his bird was on stage too. Marlon and Howard both agreed that the act seemed more for a child’s party rather than for the big stage of Radio City. Judges Comments: Howie called it a big family act. Mel B. asked about his other puppets, and Paul said there’s more of him to see. Heidi called his material “clever”. Howard said he’s a “cartoon come to life” and thinks Paul will be a main contender. Marlon said it was wonderfully orchestrated and made him feel like a kid and wants everyone to have that feeling of joy. 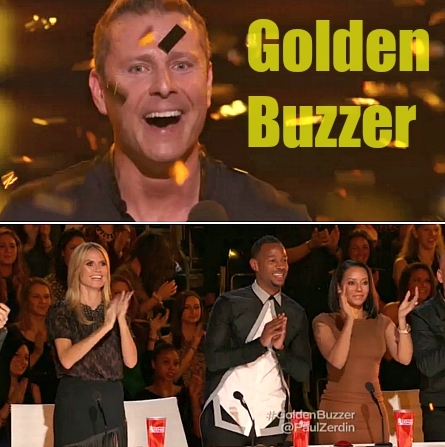 Because he loves comedy and he loves Paul, he hit his Golden Buzzer. Howie was glad that Marlon picked a comedy act. He’s a mentalist who read Mel B.’s mind last time that she was thinking of a vacation from the 1990s. His act this time around was reading which male and female celebrity Howie and Howard were thinking of after seeing their names in notepads. Judges Comments: Howie’s reaction was that he was “flabbergasted”. Marlon said his mind is blown and “it was really incredible.” Heidi was speechless and called it insane. Howard said Paul did everything that he could in order to secure one on of the seven spots. Brittney is a 24-year-old retail worker whose talent is singing. The judges weren’t thrilled with this second audition. Howard said she had a lot of trouble with the song and doesn’t think AGT is the best platform for her. They are full figured women ages 25-30 years old with a lot of groove in their dance moves. They danced to Jessie J’s “Bang Bang” song. Judges Comments: Howard, who gave them an X, told them that their routine was not special and did not distinguish them enough to beat out six other acts that will move forward. Heidi said she was disappointed. Marlon enjoyed their performance. Howie said they brought less this time than last time and that their act can’t be based on their size. Mel B. liked their big girls message and said she would fight for them in deliberations. They are a family act that includes father and children ages 21-51 years old. Judges Comments: Mel B. said they make everyone feel happy. The crowd yelled to “put them through.” Marlon said they did a great job and he enjoyed himself. Howard said he felt like he was on “Hee-Haw” and thinks they’re talented and terrific. Howie said they’re not there to judge a genre of music, but to judge the talent. Howard said he thinks he saw his package! LOL! Howie said if he could remove the dressing-up with dresses and heels, his act is NOT phenomenal. She’s a 33-year-old contortionist whom Marlon was taken by as soon as she walked onto the stage. Judge’s Comments: Howie said he’d like to follow her into the jungle and she had a lot of strength in her act. Marlon said he used his Golden Buzzer too soon, and she doesn’t have bones at all and loved it. Heidi said she had boys and girls wrapped around her finger and she uped her game. Howard said she is so remarkable at what she does and it’s what AGT is all about. Two very talented child acts were HALEY “Bulletproof” GLASS who is an 11-year-old martial artist, and CAILYN A. MATHIS, a 14-year-old dancer. Currently a stay at home dad who plays in bars said making it to Radio City on AGT would be life-changing. He sang “Jolene” song by Dolly Parton. Judges Comments: Howard said he surprised him and he liked it. Heidi said his voice is “rough around the edges” and liked it. Marlon said it was the angry note that got him and he’d buy the album. Mel B. asked if this audition is enough? Howie said “if you’re going to sing, then you have to bring it” and Benton did that. When acts Vita, Dana Daniels and Doll’s Love got on stage to hear their fate from the judges, Howard told them that AGT is the only show where people can tune-in to see acts like theirs which are all so unique. The only one to go through was Vita. Pretty Big Movement, Haley Glass, and Triple Threat were on the stage together to hear their fate. The judges chose to keep Triple Threat. Singers Benton Blount, Brittney Allen and Johnny Shelton stood on the stage together to hear who’d be going to the next round. Howard said it was brutal and Mel B. said it was the most difficult one the have had so far. The act moving one was Benton Blount.